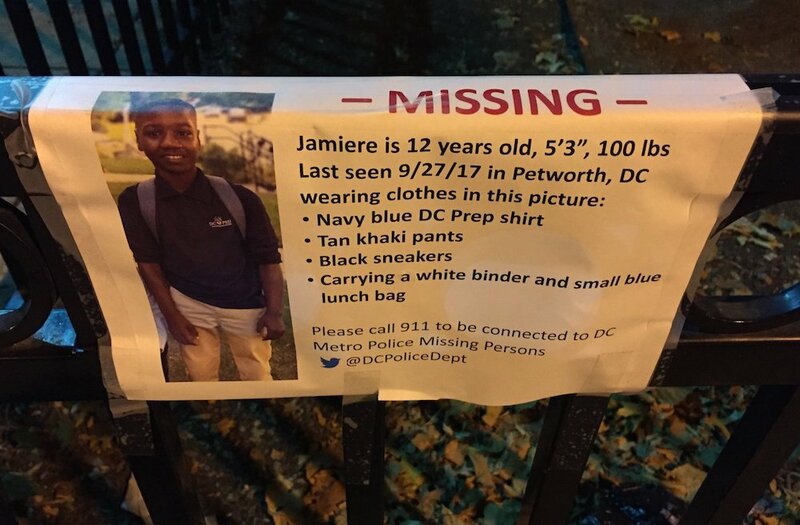 A poster of Jamiere taped to a sign at a park. He has been seen 3 times, once at Safeway on Piney Branch, once at 19th and Benning near a school he used to attend, and once at Shepherd Park Library. All familiar spots for him. He is alive! And close! The best thing people can do is look out for him. He changed his clothes to a maroon Chicago bulls shirt, jeans, gray hoodie, and black sneakers. He likes to go to libraries on our bus routes for the wifi and librarians aren't allowed to identify visitors so those are good places to check frequently. If you see him, dial 911!